The Reggae Review: Ziggy Marley Goes Wild and Free! 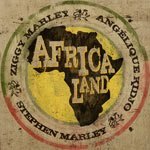 A TuneCore Artist since early 2006, Ziggy Marley is back with a new single, Africa Land, in honor of the 2010 FIFA World Cup. I had the chance to chat with him about the new release that is close to his heart, and his thoughts on how focusing on single releases and offering free downloads is helping him get his music, and message, out to more listeners than ever. Africa Land, which features brother Stephen Marley and Beninoise singer-songwriter Angélique Kidjo, is a celebration, meant to promote the idea of African unity, as well as global unity, during this time when "all eyes are on Africa." Marley drew from many different sources to create the sound and vibe of Africa Land. His concept was to bring together the sounds and groove of African reggae and dancehall beats to create something that could be danced to. This was a collaboration in cultures, styles, and artists, and in this way, the bones of the song itself symbolize unity as much as the meaning that comes through in the lyrics. According to Marley, Africa Land went through many phases, or as he calls them, "growing pains," in its creation. "It changed so much from the first idea to how it ended up," he told me. One of the most notable changes was the tempo; it started out as a very slow song and became much faster as the development went on. Marley explained that for him the creation process is all about experimenting, seeing what goes and what doesn’t, and learning what new form the music can take. Africa Land is the first release in a series of free singles by Marley, called the Wild and Free Singles. And according to Marley, these singles can be described as exactly that, "wild and free." When I asked if there is a thread that will tie together these releases, Marley explained that more than a central theme is a central spirit: "Something that is wild and free really doesn’t have any rules, it just does what it does." Each single will have its own energy. There is no specific time frame for the releases each single will come as it comes, as Marley allows it to unfold and truly be wild and free. The Wild and Free Singles demonstrate that in this digital world of music, releasing music is not dependent on whether or not a full album’s worth of tracks are complete for distribution. Got only one song ready? No need to wait for the rest of the album to come together before your music can get heard. "It just goes back to what it was before put out a few singles before the album," Marley commented. "Doing one song at a time as singles is also interesting because you can focus on one song, you’re not worrying about 9 or 10 songs." I asked Marley why it was so important for him to distribute Africa Land, as well as the other Wild and Free singles, to stores that would sell it at no cost. His answer? "I don’t need to sell everything, everything is not about selling, buying, and commerce. Some things are just about giving." He sees this "giving model" as a way for any artist, no matter how well known, to get music out and generate interest. If the object is to be heard, the music needs to be out there, and easily obtainable: "Let people get more exposed to your music so they may be willing to buy some music eventually." So how has digital distribution shaped him as an artist? For one, it has gotten him much more involved in music creation as well as the music community in general. "When I started out doing music, everything was physical. I’m really starting to want to communicate more with the fans over the internet and get a feel for what they’re feeling and work with them to make some good music for them. I like that interaction actually, it helps me to make better music."